With nearly 1,000,000 viewers in attendance over the 3-mile route the annual Fiesta Flambeau Night Parade is the largest illuminated parade in the world. 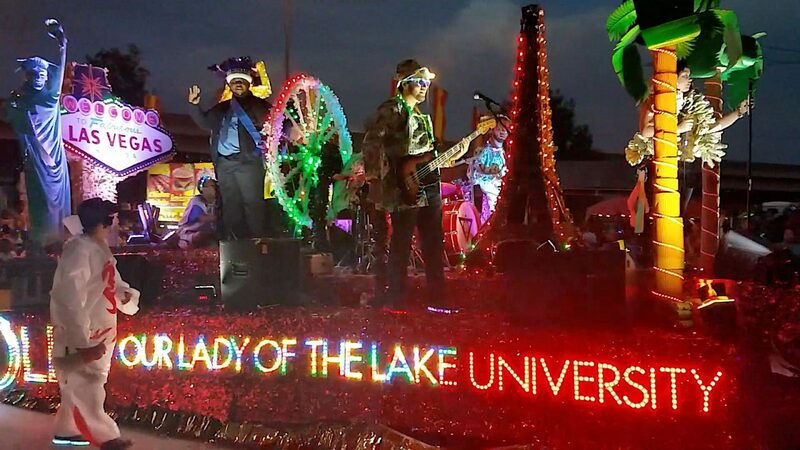 This year Living Light Shows outfitted the “Our Lady of the Lake University” float with our latest technology RGB Pixel systems. The float was only one of a handful using RGB Pixel technology and the only one that synchronized them to custom programmed effects. Unfortunately we were only able to grab a few seconds of substandard cell phone video of the 34-second light show that looped continuously between elements on the float in pre-programmed patterns.